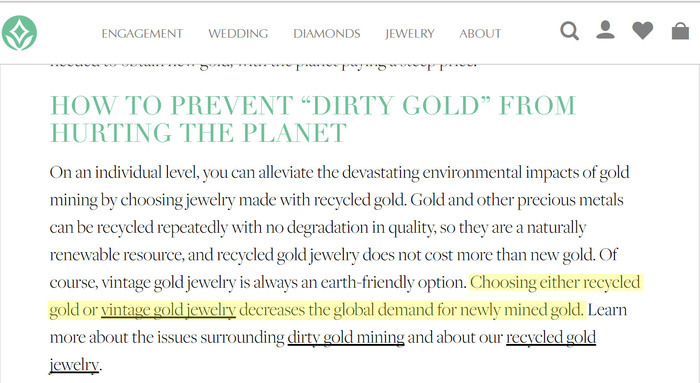 The only possible way to make the recommendation to a customer to purchase recycle gold (dirty gold) simply because it doesn’t disturb the earth is to ignore how “ethical” choices exist in context to our interconnected world. Critically, and this is where the specious argument gets stretched even further, those who purchase recycled gold are led to believe it has an impact and reduces mining in the future. While it is true that recycled paper reduces the need for more trees to be cut down, it is 100% false that recycled gold reduces mining activity. Consider the case of large-scale mining, which produces 80% of the world’s gold supply. The world’s top gold producer, Barrick, is never going to stop their mining because of eco-friendly recycled gold wedding rings being sold. They mine to enrich their shareholders. Gold always has value as a currency hedge. Likewise, the small-scale gold miner (20% of global supply) is not going to stop their digging with shovels because of these recycled gold rings. They mine to feed their families—and as long as gold is being dug up, there will be a buyer waiting. We cannot influence large-scale gold mining. It is the politics of greed. What we can do is focus on the small-scale producers. That is the politics of bread. As long as they are out there mining, the only truly ethical path forward is to help these people mine in a way that supports them to live with dignity while minimizing environmental impact. But let’s consider, now, the impact of the choice of a recycled gold wedding ring verses a Fairmined/Fairtrade wedding ring in context to the broader supply chain from the environmental perspective. Small-scale mining is the second largest contributor to global mercury production after coal fired plants—just over 40%. It takes up to 3 grams of mercury to produce one gram of gold in small-scale mining. Let’s say that the recycled gold ring that you sold to your eco-friendly customer used 5 grams of gold. If 20% of the ring was from small-scale miners, that’s about 3 grams of mercury into the environment for the dirty gold ring your customer now wears believing it is eco-friendly. If you purchase 5 grams of gold from a Fairtrade or Fairmined certified small-scale mine, that’s 15 grams of mercury not in the environment. Adding up the totals, the difference between recycled and Fairtrade/Fairmined is 18 grams of mercury into the environment. In context to the history of ethical sourcing in North America, the notion that recycled gold is ethical or sustainable was once helpful. I was one of the first adopters, in 2007. Back in those days, when I was showing in the Designer Section of JCK, when I talked about ethical sourcing and fair trade, buyers would look at me like I was a lunatic. At that point, recycled metal's value was raising ethical issues, and also responding to Earthworks’ No Dirty Gold campaign. Many of us knew at that time that it was an imperfect solution, but it was all we had. 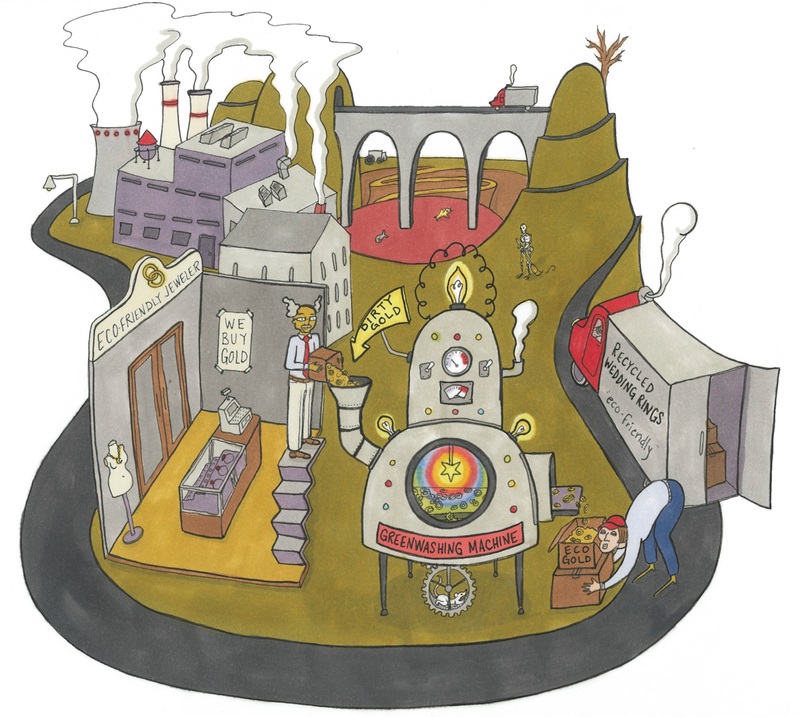 Since 2011, and particularly over the last five years, with the availability of certified gold from small-scale mining communities, claims about the ethics of recycled undermine an ethical sourcing movement based upon local economy and mercury pollution in small scale producer communities. Still not convinced? Still love your recycle gold wedding ring story? Check out these two photos I took in Kenya. To the left a guy washing his hands in mercury and water. He will burn off the gold in his frying pan. He will eat that mercury and poison his family and all the fauna and flora in his area. That poisoning will last for generations. 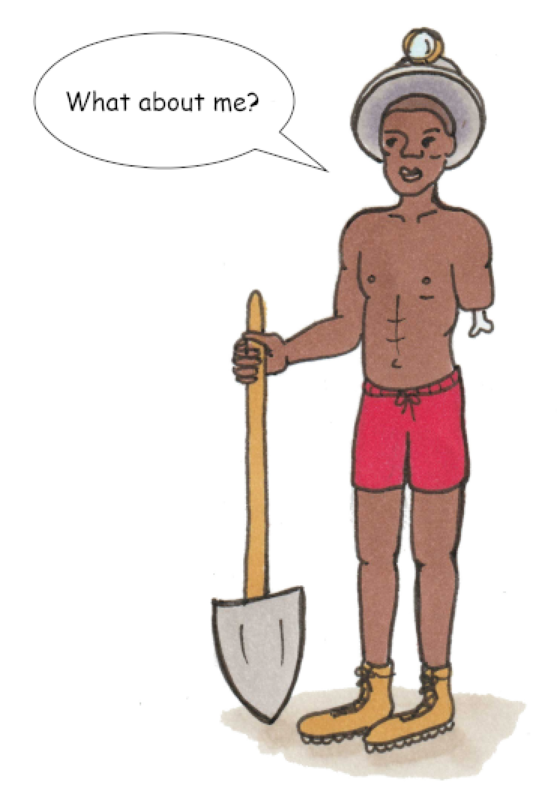 To the right is a miner doing the same thing supported by Fairtrade to implement best practices. Do you care about the guy mixing his hands in mercury water? Every time you advise a customer to purchase a recycled gold ring over Fairmined/Fairtrade, you are saying you don't care. Do you really think your customer would choose recycled gold if they saw this photo? Every time you claim thyourir recycled gold is an ethical solution you are advocating for an “ethics” that ignores real suffering and environmental toxicity as a legacy for future generations. It is an ethics of narcissism. This year in the US alone, 300,000 babies will be born with dangerous levels of mercury contamination. There are about 20 million pounds of mercury from over 50,000 legacy gold mines in California flooding water in agricultural areas, such as the central valley. How can we pitch recycled gold ethics which will add to the suffering of people living in producer communities with the same future problem? In the UK, ethically sourced gold from small-scale miners is the mainstream choice for those concerned about social/environmental issues. Major suppliers carry huge varieties of mill products in Fairtrade Gold. There are over 250 Fairtrade Gold jewelers. No one would take a jeweler basing his ethics on recycled gold seriously. Their ethical jewelry movement, far more than what’s going on in the US, puts small-scale producers at the center. Why, we have to ask, is it so different in North America where both Fairmined and Fairtrade Gold have failed to make a market impact? With Brilliant Earth’s consumer-facing narratives, and the endorsement of major supply houses and the RJC, and even progressive pioneer ethical jewelers, recycled gold has become the perhaps the most pernicious obstacle to an ethical jewelry movement in the US. What can we do to change the edifice? That is the important question in this world where everything is interconnected, in this time of the Anthropocene, of climate change, mass extinction. Pay attention to the hidden agenda($$$) behind language exercises, recycled vs sustainable, trade magazine editorials, ill-informed influencer bloggers, large retail and mining interests consultants, and enabling NGOs wanting to find their next funding source. Almost all of them need to support the edifices in order to make a living. Also, to make definitions for “the trade” without input from diverse communities, and especially producer communities still suffering from mining atrocities is white privilege! All this concern about defining sustainability when we could instead be focusing on stopping babies from eating mercury out of frying pans. And building a market here in the US which raises these issues honestly. The question is, what are you going to do to reduce the suffering of exploited people and help transform the current ethical jewelry movement in the US into something that breaks the deep patterns of exploitation and neocolonial now masked behind a new ethical shine? To learn more about the deep history and hidden agenda behind ethical jewelry, read my 45,000 word Ethical Jewelry Expose: Lies, Damn Lies and Conflict Free Diamonds.